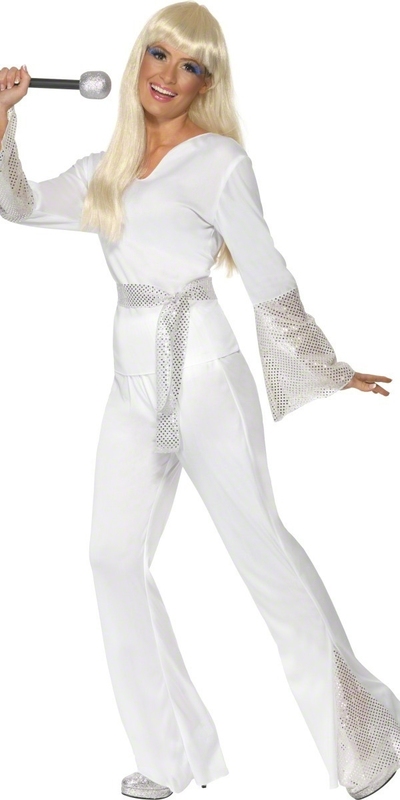 Our Adult 70's Disco Ladies Costume comes complete with the White Top featuring the Flared Silver Sequin Trimmed Sleeves along with the Matching Elasticated Trousers and Sequin Tie Belt. 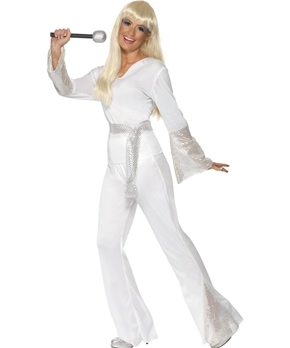 Please see Measurements Below as Costume is Small Fitting. 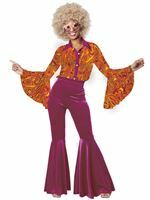 Small 8 - 10 32" - 34" 28" - 30" 30"
Medium 12 - 14 34" - 36" 30" - 32" 31"
Large 16 - 18 38" - 40" 34" - 36" 31"
Wore this for a 70's party. Looked the part and got good comments. I'm size 10/12 and luckily after seeing the comment sizing is small I ordered the large! Great value as bought in the sale. Nylon material so you do get hot! Fantastic delivery service, ordered next day delivery and arrived on time. I was in a production doing songs from musicals and had to have a quick turn around of outfits. This outfit was perfect, having no zips or buttons to worry about.